Mobile broadband is a popular internet connection alternative. It's important to understand the security ramifications and tradeoffs. - Ask Leo! Mobile broadband is a popular internet connection alternative. It’s important to understand the security ramifications and tradeoffs. 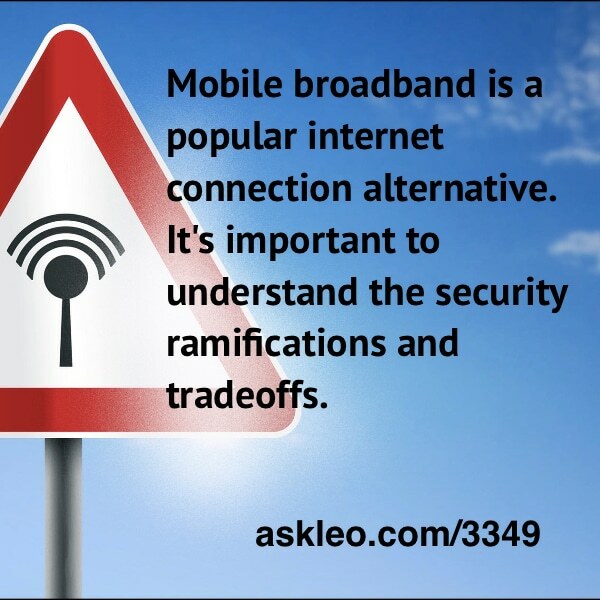 Is Mobile Broadband More Secure than Wi-Fi? - Mobile broadband is a popular internet connection alternative. As with any connection, it's important to understand the security ramifications and tradeoffs. Is it safe to use a mobile banking app over an open Wi-Fi connection? - Checking that all apps are doing it right is not feasible, but I set up a sniffer to verify that Gmail was using an https secure connection. The results? An Update to My Internet Security Book - It's time for me to update my book "The Ask Leo Guide to Internet Safety". Now's the time to let me know what you think should be emphasized, clarified or covered in the new edition! « Previous post: Voltage and polarity of a new laptop power supply must match the old one.